Simplicity; The art of success. What is the difference between trading and investing when looking at the currency market? For me, it comes down to time horizon. It is obvious that the longer down the time curve you travel, the harder it is to make money and the deeper pockets you need, hence it becomes an investment. So, when does a trading position become an investment? Obviously, there is no hard and fast cut off and I think it is more a state of mind when the position is taken on. Traders trade and investors invest, end of story, so let’s concentrate on trading. I read so much stuff online from people simply trying to impress me and I am assuming the trading community. The talk is of this market and that market, most of us have never heard of, and even fewer have the slightest interest in! They try to sell us correlation and contagion using some difficult to explain reasoning yet all we need to trade is generally right in front of us. Technical or fundamental or a mix of both is all you need. This spread and that are of little consequence. I am a firm believer in balance in a portfolio whether that is currency, trading method or trading style. Variety is the spice of life so change things up a little to retain focus. Bitcoin has become something of a disappointment to many of those who bought into the idea of making millions, earlier in the year. The purpose of the “flagship” cryptocurrency is obviously deeper than pure speculation although that is lost on many. Its rally was far more a case of hope than understanding. It has been close to $7k this week and that is testament to those who still own it. It isn’t $20k or even $15k or $10k. It retains value and that is despite the naysayers who say it is worthless since it has no lender of last resort or asset to back its price. For me, Bitcoin is a “project under development”, perhaps a preparatory stage prior to the next development in a non-centralized exchange of value, which is what we all seem to crave now. It is allowing those on the outside or even the periphery to understand the concept. 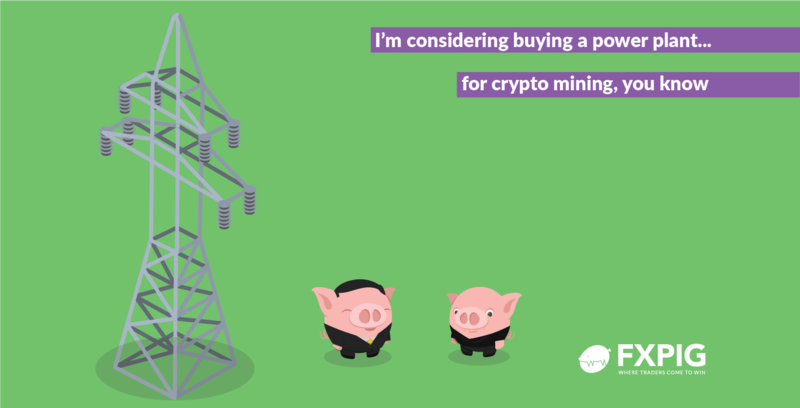 The talk of regulation has faded to a large extent now but that and the cost of mining not just Bitcoin, but all new and existing cryptocurrencies is grabbing attention and rightly so. That is the major issue. The market is full of entrepreneurs who want to push the envelope and develop something new and unique but when they look over their shoulder many see the destruction and mess they have left behind. It cannot be right that next year mining Bitcoin will use as much electricity as is used annually by the Netherlands! That’s what I read anyway. True or not it attracts attention! I have really tried to stay away from my pet subject over the past few weeks, but the time has come! We have been promised the British Government’s proposals for the future relationship with the EU in “early June”. That could be the single most important day for Sterling since the Brexit referendum itself. Option players will be looking at strangles as there is likely to be a large move in the currency come what may. Direction is the only issue. Proposals that dictate a soft Brexit and the pound should rally although that rally may be short-lived if it means an open border between the two parts of Ireland. Proposals that panda to the hard-line wishes of Brexiteers (surely the whole premise of Brexit) will see a further selloff as the economic fallout will be massive. Another problem is that there has so far been no indication about when the announcement will take place. I assume we watch the UK press as there is sure to be a leak before the proposals are made public since the Government is about as watertight as a sieve! Once the Brexit cards have been played, Brussels will probably have to turn its attention to Rome where, despite the being agreement over the choice of Finance and Economics Minister, the coalition Government is still going to be fiercely anti-EU.